Trump: 'Cruz is one hell of a competitor' Jump to media player Donald Trump has won the Indiana primary. Cruz: 'We are suspending our campaign' Jump to media player Ted Cruz announces he is ending his campaign for the US Republican presidential nomination, after losing heavily to Donald Trump in the Indiana primary. Cruz: Trump is a 'pathological liar' Jump to media player Ahead of the Indiana poll Ted Cruz calls Donald Trump a 'pathological liar' after Mr Trump suggests Mr Cruz’s father was linked to JFK’s assassination. Cruz confronts Trump protester Jump to media player Republican presidential candidate Ted Cruz confronts a pro-Trump heckler as he campaigns in Indiana. 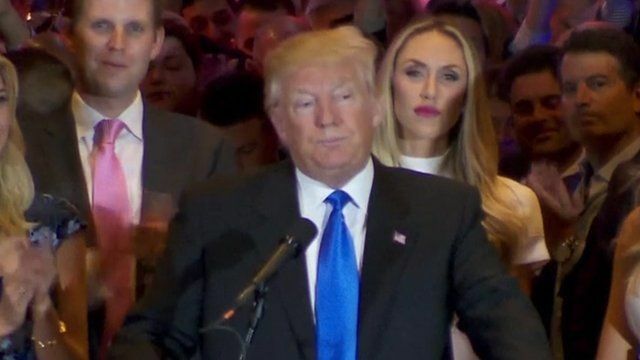 Decoding Trump and Clinton's speeches Jump to media player Donald Trump and Hillary Clinton won decisive victories in the race for their parties' presidential nomination - what did we learn from the speeches by the winners and losers? Trump jumps barrier to avoid protesters Jump to media player Donald Trump jumped a highway barrier to get to a rally near San Francisco after protesters blocked the entrance. Donald Trump has won the Indiana primary. Speaking to supporters in New York he praised his opponent Ted Cruz. "He is one hell of a competitor, he is a tough smart guy."